It seems like our bout of warm weather was a false alarm as we spent the past weekend in boots, coats and scarves. Here's hoping for warmer weather soon! Love your coat! The ruffle detail on the bottom makes it look so pretty and feminine! I'm pretty sure I saw that Oasap coat and pinned it a while back! It looks even cuter on you than it did on the website. If it's going to be chilly again, might as well wear an adorable coat and boots, right? Oh no!! I hope the warm weather comes back your way soon, but on the bright side at least you get a little more use out of that adorable jacket! Haha I had to do the same thing this weekend and wore my over-the-knee boots as well. Crossing my fingers for warm weather today!You look great and I love the jacket! bah, isn't it SO frustrating? That coat is lovely though! Just when you pack up your coats, it get cold again! I hate that! But, what an awesome excuse to wear that fabulous coat one more time! Oh no! I hope warm weather finds you soon. In the meantime, that coat is so structured and gorgeous! 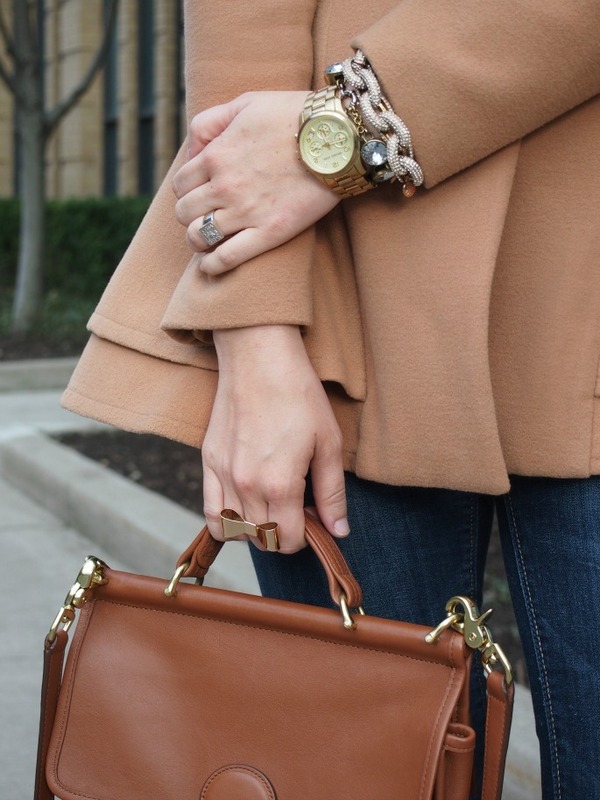 Love the camel & black and white combo! Adorable. Hope you get some more warm weather soon! It can be so confusing getting dressed in the morning when the weather can't make up its mind! that coat is too adorable! i hope it warms up there soon, our cold spell isn't quite as cold as yours but i'm missing the nicer weather! The way that you mix your prints and patterns is just on a higher level, you have an eye for style. Love seeing all your outfits. I really feel like the weather is playing tricks on us. I really love the shape of that coat. At least you got soem more use out of it this season! i adore this jacket!! it is absolutely lovely on you!! Love that scarf so pretty! this "cold weather" outfit is so sweet. Love the details! such a great outfit! Believe me this weather needs to make up it's mind! I feel the same way! Really felt like we were in it to win it with spring weather for a couple days, now back to freezing temps. But LOVE your coat and scarf, so sweet! That is no fun that is has gotten cool again, but that jacket is too cute!! We had a little bit of a cool spell last week too, but hopefully that is over now! And I love your bag. I can't believe it is still cold! What's up with that? You look so cute though. You look amazing, and I am adoring your coat. Great look.